This book has but one purpose--to prove that the earth is hollow. Therefore, instead of trying to make an entertaining argument, I prefer making a plain, convincing one. For that reason, some may think I have spent too much time on certain phases of my argument, yet I believe I will be able to convince the reader in every point I make. If I convince him in one case, the rest need no argument. Let us take up the question of the wind, a subject that has received the best thoughts of our great scientific men. These scientists cannot agree upon what makes the wind act so strangely at the poles. Peary says that at the North Pole "it is invariably radial from the centre outward, perpendicular, so steady is this wind and so closely does it adhere to the perpendicularity." How does the Antarctic explorer find the wind? If the earth be hollow, as the wind passes through the earth it would operate about the same at either entrance --under similar conditions. For instance, a great volcanic explosion at the southern end would send forth a great force of warm, dry air, which would blow out radially and upward, and spread in all directions. This is done so universally that certain writers have termed it an anti-cyclone. It must, of course, have a name, and why not call it anti-cyclone, although Granny Cyclone would be more appropriate. Call it what you please, it is the wind passing out from the interior of the earth, and when released, it spreads in every direction. The descriptions given by Peary of the Arctic winds and by Bernacchi of the Antarctic, are alike. Found at the farthest point reached in the Antarctic Circle. It must migrate for food in winter, but it cannot fly. If the earth is not hollow, where does this bird go when the ice prevents it from swimming? and it blew with fearful potency all day. Just previous to the first outburst the barometer had commenced to fall and reached its minimum reading, 28.227 inches, just before the wind dropped, at 9 p. m. These winds, always from the same direction, are a remarkable feature in the meteorology of the Antarctic. Some meteorologists have held that a vast cyclonic system and low-pressure area continues south as far as the pole, the more southerly parts being traversed by secondary cyclones; others contend that the extreme south-polar area is occupied by a vast anti-cyclone, out of which winds blow toward the girdle of low pressure. 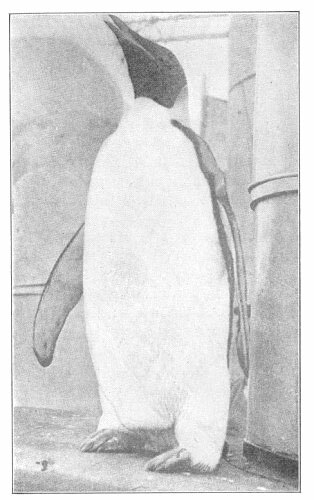 Bernacchi, page 129, after giving de-tails of a great storm, says: "About this time a very fine specimen of an Emperor penguin was caught out on the ice-pack; a big, sad, solitary bird, over four feet high. The presence of these birds so far south late in the year proves that they do not migrate far north during the Antarctic winter." This was when the temperature registered 2 deg. below zero. The penguin is a flightless bird and must seek its food in open water. If the earth be not hollow, where does this bird migrate to in winter for food? These birds are found at the farthest point south. warmer, dryer, and always from the same direction? "An anti-cyclone is a portion of the atmosphere in which the pressure is highest at the centre, and diminishes nearly uniformly in all directions, and the winds blow spirally outward. A cyclone is just the reverse, and has the lowest pressure at the centre, and the winds blow in towards this centre of low pressure in a spiral curve. a year. These are statements worth remembering. If there is no rain, and the snow is so slight in amount that it cannot be measured, where does the water come from that produces the vast number of icebergs in the Antarctic region? "The mean temperature of the air for the eleven months was 5.2 deg. Fahr. ; the amount this E. S. E. wind raises the mean temperature is 8.8 deg. Fahr. This power of raising the temperature is more conspicuous in the winter time than in summer. The power that this wind has in raising the temperature is perhaps better shown in the table of single storms, printed in Bernacchi's work. winds from E. S. E. and S. E. in a very marked degree. These winds were the most remarkable feature observed in the meteorological conditions of Victoria Land. Their frequency and force, the persistency with which they blew front the same direction, the invariably high rise in the temperature, their dryness, the motion of the upper clouds from the N. W., and, finally, the gradual rise in the mean height of the barometer to the south of about Latitude 73 S. seem to indicate that the Antarctic lands are covered by what may be regarded, practically, as a great permanent anti-cyclone, with a higher pressure than prevails over the open ocean to the northwards. "While this anti-cyclonic region may not be characterized by an absolutely high pressure at all seasons, it must be high relatively to the very low pressure which prevails to the northwards. the observations made at Cape Adare, which is almost at the centre of the area of lowest mean pressure, appear to bear out his views. "It is, however, impossible to arrive at anything definite respecting the atmospheric circulation over the Antarctic regions from observations taken at one station only." --Bernacchi, pages 295 and 296.
hard ice-crystals, and in such small quantities as to defy measurement by means of an ordinary snow-gauge." Peary says, on pages 74 and 75: "The regularity of the winds of the 'Great Ice' of Greenland, as I have found them during an actual sojourn of over seven months upon the 'Great Ice,' and visits to it of greater or less duration in every month of the year, is phenomenal. Except during atmospheric disturbances of unusual magnitude, which cause storms to sweep across the country regardless of ordinary rules, the direction of the wind of the 'Great Ice' of Greenland is invariably radial from the centre outward, perpendicular to the nearest part of the coast-land ribbon. So steady is this wind, and so closely does it adhere to this perpendicularity, that I can liken it only to the flow of a sheet of water descending the slopes of the 'Great Ice' from the central interior dome to the coast." strongly and steadily. At other times heavy gusts, as nearly as possible like the explosions of a mammoth air-gun, rush out, as described above. Nansen, on page 373 (Volume I), also speaks of the temperature rising under the influence of northerly winds. "Thursday, January 18th.--The wind that began yesterday has gone on blowing all to-day with a velocity of sixteen to nineteen feet per second, from S.S.E., S.E. and E.S.E. It has no doubt helped us on a good way north; but it seems to be going down; now, about midnight, it has sunk to four metres; and the barometer, which has been rising all the time, has suddenly begun to fall; let us hope that it is not a cyclone passing over us, bringing northerly wind. It is curious that there is almost always a rise of the thermometer with these strong winds; to-day it rose to 13 deg., Fahr., below zero (-25 deg. C.). A south wind of less velocity generally lowers the temperature, and a moderate north wind raises it." Farther on he says: "It is curious that now the northerly winds bring cold and the southerly warmth. Earlier in the winter it was just the opposite. "It seems strange to me that there is so much northwest wind, and hardly any from the northeast, though the latter is what the rotation of the earth would lead one to expect. As a matter of fact, the wind merely shifts between northwest and southeast, instead of between southwest and northeast, as it ought to do. Unless there is land, I am at a loss to find a satisfactory explanation, at all events, of this northwest direction." What Nansen says about the change of the wind since winter began, is important, and is another of the strong proofs that the earth is hollow, and that the atmosphere in the interior of the earth is of a more even temperature than on the exterior. It would also be warmer in winter and colder in summer, which all explorers have found to be the case.